Lyft is already the most affordable ride in town when you need it most. Starting today you’ll save even more, thanks to Lyft Happy Hour, the newest way to enjoy the friendliest ride at an even friendlier price. Here’s how it works. During slower times on the road, you’ll receive from 10% to 50% off your ride, so a trip that normally costs $14 would be as low as $7 when Happy Hour is in effect. You’ll be able to see when it’s Happy Hour as soon as you open the app! We created Happy Hour as a straightforward way to keep Lyft busier for drivers and more affordable for passengers. For instance, a driver who would normally have one ride per hour at $12 may now see two or more rides per hour at $9. On the passenger side, users will know that Lyft will always be the most affordable option since prices go down during slower hours. 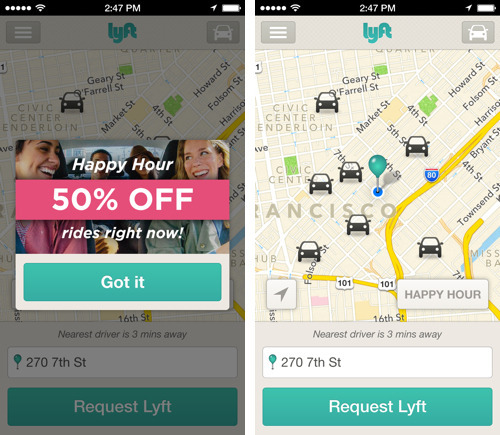 With Happy Hour, Lyft’s prices are fully dynamic, which is the way it should be. Craving a late night froyo run? Running to an afternoon meeting? Update the app now to unlock Happy Hour, and let the good times roll.